When it comes to shipping from China, CFC has been proud in this freight forwarding industry for more than 20 years, and is good at providing ocean cargo services for small and medium companies as well as individuals all over the world. As a top-rated China freight agent, we’d like to share our knowledge and experiences in this article, and hope all the information below can help you improve your supply chain management. We are constantly updating this guide, make sure to come back and check the information you need from time to time. Besides, we can discuss more about your specific logistics requirement by submitting our quote form. Let’s take one shipment process for example, from the supplier’s address to your designated address in your country, from the very beginning to the final end. If you are preparing your 1st shipment, we suggest check this import guide first. These are four common terms of trade (aka incoterms) when buying from China. A product price is always quoted according to an Incoterm. In brief, it can be divided into 2 categories. EXW and FOB means you – the buyer can use your own freight agent and pay for their services directly. Other term means the seller use their freight agent and you still pay for that. Commonly, you can find the term states clearly in the Proforma Invoice or Quote Sheet provided by the seller. If not, advise the seller to add into the papers to avoid any further confusion even dispute. When you compare prices from several suppliers, make sure they are based on the same term. For example, A-seller quoted EXW $5/unit while B-seller quoted FOB $5.5/unit, it doesn’t mean the price from B-seller is not more competitive than A-seller. * Most suppliers will quote EXW or FOB price at the beginning, and are flexible in providing different price based on different term upon your request. If you are new to importing, and haven’t found the right forwarding agent, you’d better choose an incoterm that takes the cargo as far as possible, until you are definitely sure you can handle the rest. But since you have us, we suggest you can select EXW or FOB, and let us assist you manage the transportation to your port or to your door. Please note: Even to-door service, unlike parcel delivery companies (Fedex, UPS, etc. ), common FTL/LTL carriers typically only provide dock-to-dock service or curbside delivery where the driver does not touch the freight. This is known as “Dock to Dock” or “Shipper Loads / Receiver Unloads”. So commercial dock or curbside delivery only. Residential or inside delivery means extra fees. Quite a few buyers seek advice from us about choosing EXW for the max control of the goods. Generally yes, but it depends. The difference between EXW/FOB is if the seller handle the internal trucking to the port, prepare customs documents, and pay local fees accordingly. Pickup from anywhere in China mainland will be ok for us. But exporting customs clearance may be in trouble for some certain products, such as wooden furniture. Since Commodity Inspection (a document issued by the Entry-Exit Inspection and Quarantine Bureau) is mandatory for a few goods, and it has to be done by the producer/manufacturer. If the shipment is just samples or small (under 150kgs and 1cbm), select EXW. If the shipment is to Amazon FBA warehouse, select EXW. Other cases, request the seller quote based on FOB AND list the FOB fees separately, then we can tell if it’s too much or reasonable. Marine insurance is very cheap, rough US$50-US$100 based on the shipment invoice value. There’s no reason not to have your consignment insured with a little additional money. It will cover the transportation damage, but please note it doesn’t cover any quantity or quality issue. * General purpose commonly means Dry Container (DC). Sometimes if fluid goods are packed by a flexible container bag, it can also be delivery by standard DC. 20’GP is designed to carry more weight than voluminous cargo. Example – minerals, metals, machinery, etc. all of which are heavy goods. 40’GP is designed to carry voluminous cargo rather than heavy cargo. Example – furniture, tyres, toys, etc. all of which are voluminous goods. 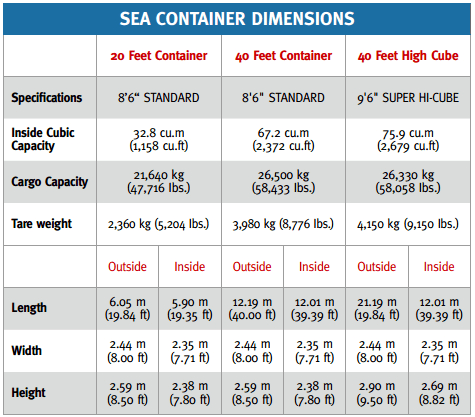 The ocean rates from China for a 40′ container is less than double of a 20′ container – you may take it as rough 1.5 times for easy reference. And the 40’HQ cost the same as the 40’GP, sometimes higher US$100~200. In addition to the above three common containers, there are special types if your cargo is not so regular, such as Reefer Container, Open Top Container, Flat-Rack Container, Tank Container, etc. You can buy just the quantity products you need, and forget about how much space it takes. But sometimes it may cost additional $1000 for the extra from the full container. This is not necessary in most cases. You’d better request the quote based on the quantity you want, and let the seller also advise the weight/volume data. If it’s less than 15 cbm, that’s fine, go ahead. If it’s more than 15 cbm, you may consider buy more to load into a full container. FCL, full container load, which means your goods loading into a full container. You buy large quantity, and the freight cost per unit will be less. It’s from CY (container yard) to CY. LCL, less than container load, which means your goods and other importers’ goods consolidating together from the same loading port to the same destination port. You buy the just right quantity suitable for your specific target market. It’s from CFS (container freight station) to CFS. Your cargo must be sufficiently protected, from the factory to a loading port warehouse, and stacked in a container for up to a month. Then to a discharge port warehouse, and finally on a truck to you. Here’s the common pallet size. 40*48inches (1016*1219mm), for the U.S.
You’d better provide the shipper with explicit and clear export packaging specifications. Do not leave anything to their interpretation, and provide graphical examples whenever possible. A question for you. If your shipment is less than 1cbm, for example, 0.4cbm with 50kg, still LCL? Please note the minimum billable weight/volume for LCL is 1 cbm or 1 ton. You may think delivery via sea is always cheap. But in fact, courier such as DHL/UPS/FedEx is more competitive for this kind of small package. Generally speaking, it’s better to choose express courier than LCL for the billable weight of a shipment under 100kg, sometimes even 200kg for certain destination countries. LCL rate = total ocean cost? You may get the quote – ocean rate $40/cbm to your port. Please be cautious and try to have a clear thought first. Don’t take it for granted that that’s your freight cost. Actually, it’s just a small percentage of the total cost. Much more will be charged at the destination. As you can imagine, loading a few LCL shipments into FCL before departure and unloading them after arrival, it takes quite a lot of time and efforts. Not only the physical in-out, but also complicated shipping documents. The unit LCL freight price should be higher than unit FCL. You can choose FCL or LCL as you wish. But there’s a basic rule you should follow. Why? Click here to dive into. Sea shipping starts from a port and end at a port, which means a standard container rate or less than container rate is port-to-port. Among the world’s top 10 ports in 2018, more than half are located in China, actually 7 of 10. Here’s a rundown. Situated at the tip the of the Yangtze River delta, enjoys the most economically developed hinterland in China, and can extend its reach further to the interior provinces via river ports along the thousands-mile-long waterway. There are innumerable factories of neighbouring Jiangsu and Zhejiang provinces. This is the gateway to Hong Kong and the Pearl River Delta, making it another key port as it connects China’s southern hinterland to the world. Qianhai-Shekou Free Trade Zone, which covers entire west port area, provides more efficient customs clearance and better trade links with overseas markets. HK, as a transhipment harbour for cargoes mainly focused on China’s exports and imports, provides about 340 container liner services per week, connecting to around 470 destinations worldwide. It’s on the way into an “international shipping service hub”, which has core competencies in the maritime services sector, including shipmanagement, brokerage, leasing and financing. Located in the Pearl River Delta, Guangzhou has historically been a key centre of trade in China. It strives to make itself into a truly international shipping hub within the Maritime Silk Road component. It provides additional origin port options for importers, exporters, third-party logistics companies and ocean carriers, as well as promoting the Nansha Port Area. Port fees and berthing fees will also be reduced by 2018 to attract more liners. Qingdao is most important port in northern China and part of the vital Bohai Bay port cluster that serves this region. It is also going big on data, automation and e-commerce, in line with top global ports. It’s the starting point for the first Qingdao-Central Asian international cargo train in July 2015, with the capability to link up with the countries of Kazakhstan, Uzbekistan and other strategic countries through to Europe. Tianjin is one of the largest and busiest ports in China, and second only to Qingdao port in capacity in northern China. The port’s container-handling business remained steady, additional domestic and international routes are developing. It will accelerate the development of its container business, consolidate the scale of existing routes, develop new international routes with stable supply and explore new routes to emerging markets. Xiamen sits in the mouth of the Jiulongjiang River and has over 68 shipping routes, shipping to over 50 countries and has strong links with Kaohsiung in Taiwan. The port of Dalian is the most northern ice free port and is the largest port in North East China with links to ports in over 160 countries. It also serves seaports in East Asia, North Asia and the Pacific Rim. It has hopes of future benefits from China’s One Belt, One Road policy, by opening international container routes, and using multimodal transport systems. The group has also pursued aggressive marketing strategies to support the port. It is looking to utilise its competitive advantage in intermodal transportation to collaborate with the relevant authorities to expand the railway network from China to Europe, thus linking up the maritime transportation of container. You can use our resource page to monitor your shipment status at the loading port. You don’t have to pay much attention on the geographical location of your potential vendor. No matter where your Chinese supplier located, your goods are never too far from one of the world’s largest and most productive ports ready to ship your goods out of China. There are 79753 vessels totally, 5064 of them are containerships (data till 05-2017). Now the biggest container vessel has the capacity of more than 20,000 TEUs. 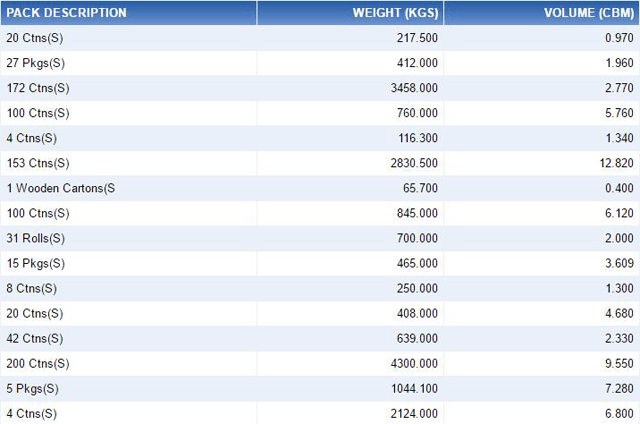 Here’s a table below showing the Top 12 Big Players in Container Shipping (04-2019). And a list of slogans. Find more about China shipping routes. The carriers are more centralized than ever before. They have formed into 3 alliance – 2M+HMM, Ocean Alliance, The Alliance. It’s almost impossible to negotiate a better price if you are a small or medium company. Simply choose the earliest available vessel after production ready, that should be all right. The general ocean rate includes the base rate and surcharges, but NONE customs clearance and port charges at both sides, duty & taxes may occur, and other miscellaneous charges. By the loading port, the destination port, the container type/weight/quantity. For example: How much does it cost to ship a 40′ container to Australia? It cost rough US$1,000 for shipping 1×40’GP from Qingdao port to Sydney port. By the loading port, the destination port, the volume, the weight, the volume/weight ratio. For example: How much does it cost to ship 10 cartons to Canada? It cost rough US$65 per cbm for shipping 6cbm light goods from Shanghai port to Vancouver port. To-door means the destination charges and fees are prepaid. All these fees make up the landed cost. Never assuming the basic shipping charges plus the products cost as your total cost. For example, a port-to-port quote, EXCLUDE all destination charges, which may include: terminal fees, handling charges, customs clearance/inspection, duty and Tax (if applicable), delivery to your address, storage, insurance, etc. Destination charges vary depending on a destination country, carrier and the delivery agent. Guiding the consignee in the complexity of cargo recovery procedures is responsibility of carrier’s destination agent/broker. The international shipping industry, and the freight rates within it, are always volatile. There are plenty of variables that factor into it, including but not limited to capacity, demand, oil bunkers, market perceptions, seasonal behaviors, labor issues at ports, congestion, disruptions, and strength of economies. Unless you have a rather large consistent quantity (10 plus containers per month) then you’ll not likely to get a quote for longer than two weeks. It may vary every week. Sometimes, if your supplier could catch up the earlier route by finishing the production one or two days earlier, you can save quite a bit. The price for 1x40ft container may increase US$1200 in the next week schedule. So knowing the rough date your shipment ready is essential for requesting the exact quotation. Generally, ocean FCL rates are generally valid for up to two weeks at a time (expiring on the 15th and 30th of each month). LCL rates may last a bit longer, usually expiring at the end of each month. Seasons with rain, storm or snow may impact the in-and-out for trucks and vessels, but busy seasons for shipping don’t necessarily coordinate with any other typical seasons of the year. Peak season for China exports, is typically the month before Chinese New Year (January), and the 3rd quarter of each year (From July to September) when many made-in-China products shipping for Back to School, Halloween and Christmas. The freight cost will be relatively high at these times, because too much shipments waiting for delivery. You’d better plan accordingly as there is a finite number of containers and vessels available. This is only a brief introduction. It’s so complicated to calculate the freight rates. You can learn more from here, or just leave it to the pros. How many packages? Package weight and dimension? How many days for production? The trade term? Even you have not make the decision to proceed to buy, you may still advise the seller to provide the rough data. After got the freight quotation from us, you can have a clear thought about the total landed cost. Estimated Transit Time (ETT) is the time between the Estimated Time of Departure from origin (ETD) and the Estimated Time of Arrival at the destination (ETA). As for sea cargo transportation out of China, there’s only a very rough idea showing below. You can find the schedule link of each carrier for reference. Please note that there maybe 5~10 days differences in practical transportation, vary from different loading port, different destination port, and different carriers. Here’s an example showing each time cost for different ocean carriers from Qingdao Port China to Hamburg Port Germany. ETDs and ETAs are never guaranteed by the sea carrier and are subject to change at any time. Also keep in mind that it can take upto 7 days before the cargo is loaded at the loading port. The same thing is true at the destination port, 1 week or more for discharge and dispatch. Container carriers’ reliability is not so dependable, and the global on-time performance percentage is rough 60%-80%. Click here to find your shipment transit time. Transportation by ocean is quite slow, which means you need to do some significant planning, and have generous margins for the possible delays. Besides, most manufacturers in China don’t stock any products, and only made-to-order. So place your order as early as possible. We suggest 3 months in advance. For example. If you need your goods ready for the Christmas season, you’d better place your order in August or even earlier. You can also split up your shipment into 2 parts: small percentage by air, rest by sea. Sometimes your shipment is late than schedule. Maybe the bad weather, the port congestion, the routing change, etc. The schedule reliability is no better than 80% among the global lines. Cargo tracking will let you well known the most accurate ETA, then you can get prepared and notify every party involved. Container tracking means you are being aware of where your shipment is located, so you can prepare accordingly. In order to track a container, you need to know which shipping line is transporting your cargo, and the container number, booking number or document number (any of them is usually good enough). All the information you can easily find on your Bill of Lading. The booking number & B/L number are listed on the top right, and the container number is usually under the item of “Marks & Nos.”. 1. Quite a few carriers provide email alert when the goods moved. Take advantage of that. 2. You’d rather pay the balance to the supplier or pay the freight cost to the forwarder as early as possible, to release the shipment. Not wait till the last several days to process the payment. If there’s a payment problem, the additional warehousing and storage fees could go up by hundreds to thousands of dollars. Goods may only be entered by their owner, purchaser, or a licensed customs broker designated by the buyer. Normally the consignee will be notified via an arrival notice within 5 days or less of port arrival, by the delivery agent listed on the B/L. Several documents need to be filed with customs before your shipment arrives at port. Customs also require an earlier lodgment (ISF/AMS for the US, ACI for Canada, ENS for the Europe), for ocean freight only. The consignee is then responsible to file entry documents to the customs, arrange for payment of any duties, taxes, and other fees. Finally it’s time to pick up and to-door delivery from the discharge port by yourself or through a trucking company. 2. Determine if duties apply. 4. Following confirmation of payment, release the shipment for pickup. Unless there’s a problem, ocean freight is generally cleared within 1 or 2 days of the ship landing in port. You might just get caught up in a random inspection/exam. Non-intrusive inspections are fairly quick, but an intensive exam could take more than a week. Non-intrusive inspections cost around $275 at major ports, but an intensive examination costs around $800, not including third-party transport and storage costs. Clearance involves preparation and submission of papers required to the authority. It’s so complicated and you’d perfer find a customs broker for assistance. Smooth clearance can avoid further unnecessary detention and demurrage fees. Most of the papers will be provided by the seller. After got them, check it first to make sure the information is complete and accurate. Then you can forward them to your customs broker, and get ready to pay any customs fees occur. Our Mission is to always meet or exceed customers’ expectations by implementing supply chain solutions that provide customers with the least cost, best service logistics network. CFC specializes in transportation management services for manufacturing companies, wholesalers, distributors and online sellers that receive products from China. We or your supplier arrange inland delivery to the port. We send the copy bill of lading for your check once your goods have loaded on board. We send the original bill of lading or telex release to you. We’ll keep tracking your shipment and keep you updated till received. CFC uses our strong carrier relationships to help our clients keep their freight costs priced competitively. You have a local freight partner, you have better control of your supply chain management with money saving. Nowadays, more and more importers ship their products directly from the manufacturer in China, to an Amazon fulfilment center. From there, Amazon manage the storage and distribution. Amazon can not be used as the consignee, importer of record or final address when shipping from overseas. They do nothing during the whole process except as the receiving place. You need to comply with their strict principles and rules. We handle the shipping to Amazon quite ofter. You can rely on us if you are an Amazon seller. If you are brand new, let the supplier handle the delivery as far as possible. Then you can focus on booming your business. Simple but costly. If you have gained some experiences, then you can try to control your goods delivery through a forwarder by yourself. Simple and cheap. It’s your choice. We suggest contact a good forwarding agent as early as possible, especially a local one with international shipping options, hopefully CFC. They can be helpful in many ways, not only the logistics process, but also supply chain management. We hope we were able to make things clear for you. If you are looking for more information please let us know, and we will get back to you as soon as possible. Find more about air freight services or express delivery services.